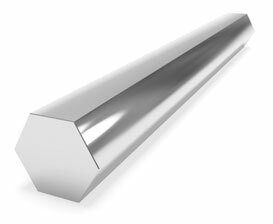 Best Stainless is also a supplier of stainless steel hex bar or hexagon bars in grades 304/304L, SS 316/316L, 17-4 PH SS, 410 SS and 416 SS. We sell less than full lengths and can cut to your specific needed size. We’ve been trusted for years as a leading supplier of round bars and we can provide the same great service for your stainless steel hex bar needs. Below is a comprehensive list of the stainless steel hexagon bar stock we supply. 3/4" 7/16" 1/2" 5/8" 11/16" 3/4" 13/16" 7/8"
15/16" 1 1/6" 1 1/8" 1 3/16" 1 1/4" 1 5/16" 1 3/8" 1 7 16"
1 1/2" 1 9/16" 1 5/8" 1 1/16" 1 3/4" 1 13/16" 1 7/8" 1 15/16"
2" 2/12" 2 3/4" 3" 3 1/2" 4"